PHUKET: The family of two Chinese tourists who were killed in an accident on Patong Hill was awarded a total of 6 million baht in compensation yesterday. Lyu Fei, 36, and his 10-year-old son were both killed on July 10 when the tour bus they were travelling on flipped over in the curve at the bottom of Patong Hill (story here). At least 22 others were injured in the crash. 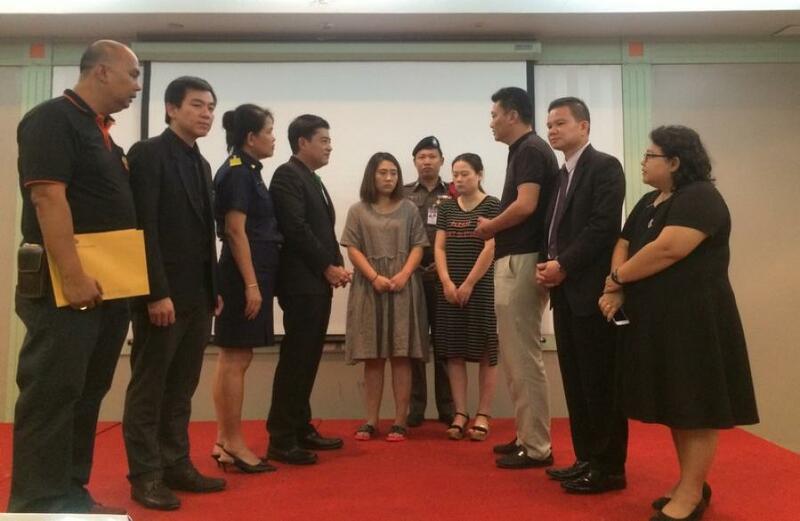 Nipon Bannawat, deputy managing director of Indara Insurance Public Company Limited, and Supong Weerasilpchai, chief executive officer of Moh Moh Insurance Brokers Co Ltd, were both present when the compensation was handed to the victims’ family. Mr Nipon said that the image and reputation of Thai tourism was of utmost importance to their company, while Mr Supong stated that they had ensured that the process and amount of compensation was fair to both parties. Following the accident, Phuket Governor Norraphat Plodthong visited the injured tourists at hospital and also called relevant officers for a meeting to discuss potential solutions to the long series of fatal and near-fatal bus crashes on the notorious hill. Two days ago, the governor announced plans to build a checkpoint to inspect the condition of cars and drivers on Patong Hill (story here).